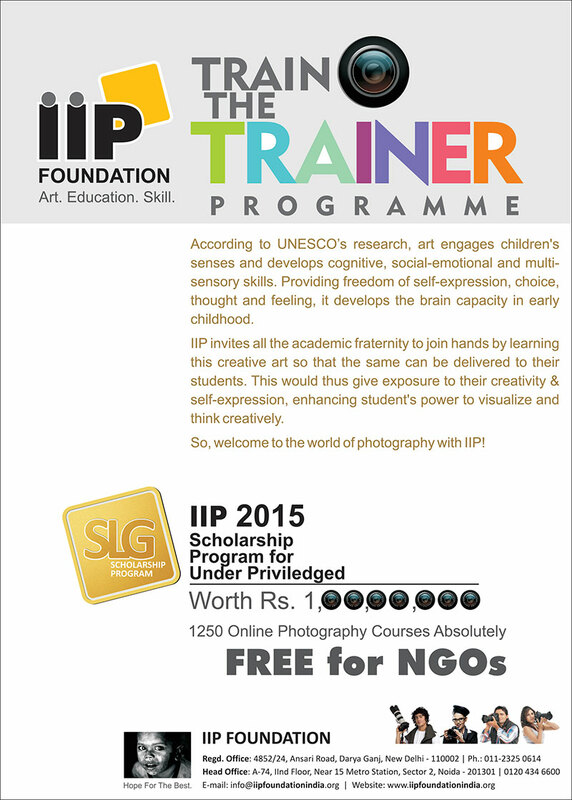 IIP is all set to launch its short term and Full term Photography and its allied subjects courses under its 'Skill Development and Vocational Training Programs on pan India Basis', and thus need mentor for the specialised courses. To make Prime Ministers mission possible to educate and provide jobs and to make 500 million skilled people self employed in the country by 2022 through 'market making' initiatives. IIP is all set to contribute its part by providing skill, awareness about the market and to make the students earn. To full fill the objective IIP has plan various courses under skill development and are all set to launch. The courses are related to Photography, lighting, assistance, mass communication, language, media, multi media, entertainment, broadcasting, content creation, animation, tourism, tourism hospitality and travel trade, ITs or software services, education/skill development services and many many more. The segment would be targeted to cover significant portion of the priority such as un organised sectors, trainers. How you can be associate - IIP is going to set up centres all over the country in almost every district. So we need infrastructure, administrators, mentors to train the students. We will first train the faculty under our 'TRAIN THE TRAINER' programme and then will expect trainers will teach the registered students. We also expect the Mentors to spread this message through advertising the skill courses through media, social media and other such possible sources, that will be supported by IIP. The courses will be commenced from next financial year i.e. April 2015. So come forward and fill the form and start the process immediately, we are eagerly waiting to hear from you. Be in quick contact with us!